Mississippi State head coach Dan Mullen says that he expected his team to be undefeated this year. It's nice that Mullen can say that now, but hasn't Mullen been saying this for years? With State's schedule at this point, haven't played neither Alabama or LSU , they should be undefeated. The question is, have they really been tested? Some say the Tide hasn't, but at least they started off the season playing a top 10 team in Michigan, State hasn't. State's biggest win to this point has been Tennessee at home in which they gave up 31 points to the Vols. The Tide only gave up 13 points- that explains maybe why the Bulldogs are a 24 and half point underdogs and not getting a lot of respect, but a win against Bama would change all of that. 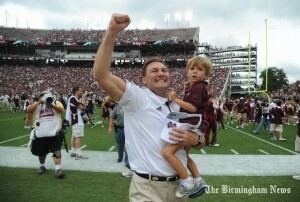 To read more about what Dan Mullen had to say about his team and the Tide, check out this link from the Clarion-Ledger.